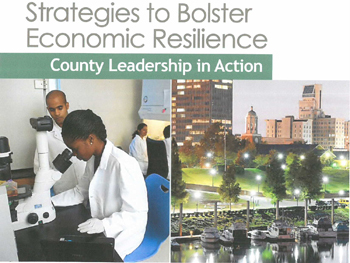 Augusta-Richmond County was one of eight counties nationally identified in the National Association of Counties (NACo) 48-page November profile of “Strategies to Bolster Economic Resilience: County Leadership in Action.” This publication highlights counties that are applying innovative approaches to economic development to bolster economic growth and improve community quality of life. In researching these successful counties, three common themes emerged – long-range planning; support for targeted industries, local businesses and entrepreneurs; and workforce development. Augusta-Richmond County was one of only three counties featured for successful initiatives in each of these categories. Mayor Deke Copenhaver says, “This report from NACo is a wonderful tribute to years of dedication and vision that many within this community have shared. City leaders along with our wonderful team of economic development professionals have allowed for this vision to become a reality, allowing our city to prosper for years to come. I appreciate all who have worked, and continue to work, so diligently in allowing Augusta-Richmond County to become all that it can be. The report highlights Augusta-Richmond County’s use of long-range planning and infrastructure development to breathe new life into its urban center and as a result was able to withstand the recession and attract new investments and improve regional quality of life. NACo also commends Augusta-Richmond County for leveraging its transportation and infrastructure assets and creating partnerships with major firms in the manufacturing sector. Finally, the report applauds the county for its investment in workforce training programs and partnerships with local universities to develop a more advanced workforce and attract and retain growing businesses. Commissioner Alvin Mason commented, “To receive this type of recognition from the National Association of Counties is awesome, and speaks volumes about the collaborative effort between the Augusta Economic County Development Authority, The Mayor’s Office and the County Commission, as we have all worked together for a better Augusta”. Mayor Pro-Tem Corey Johnson remarked that “This is a testament to the hard work and effort we all have put forth to build Augusta to be a sustainable community”.